Martin Glaberman referred to himself as an “unreconstructed Johnsonite.” Johnson being the pen named used by the West Indian Marxist C.L.R. James during his time in the United States. Glaberman was a member of the tendency James founded along with Raya Dunayevskaya in 1941, and worked with James until the latter’s death in 1989. During this time Glaberman was the managing editor of such publications as Correspondence, Speaking Out and Speak Out. Glaberman worked as an auto worker for twenty years where he served as a shop steward, committeemen and local union editor. 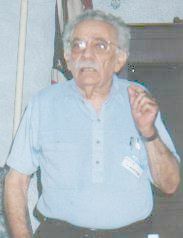 He was Professor Emeritus of Social Science in the College of Lifelong Learning of Wayne State University in Detroit. He was the author of countless articles and pamphlets, as well as a number of books. He died in December 2001. Dodge Strikers Still Stand Firm! How to Get Full Employment? Socialist Planning, Not Profits! Detroit UAW Asks National Strike Vote! Strike Still Continues at Kelsey Co.
Back the UAW to Victory!